I feel really bad that I took this picture, but Rusty wanted to see the sling. 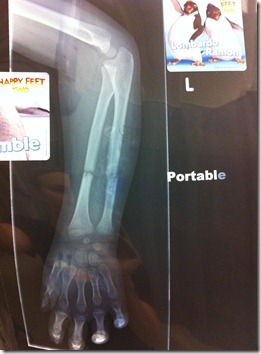 He broke both the radius and the ulna. I drove him to the ER, and Jamie met me there to take Halle and Blake home. What would I do without good friends? My other good friend Fred manages the ER at Good Sam’s where we went, and it was so nice to see a friendly face. Josh actually handled himself very well. He didn’t cry much, he just kept saying, “My arm feels weird!” After many x-rays and many hours the orthopedist arrived to set his arm. 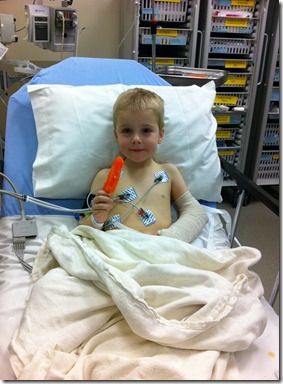 They had to sedate him, but the whole process only took a couple of minutes. 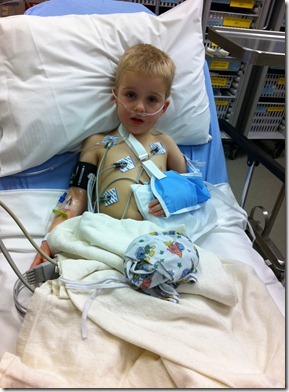 They gave him a little morphine, and so when he came out of sedation he was feeling GREAT. He got a popsicle and they sent us home. He was kind of giddy at this point and kept saying how fun everything was. Fun for who, exactly? 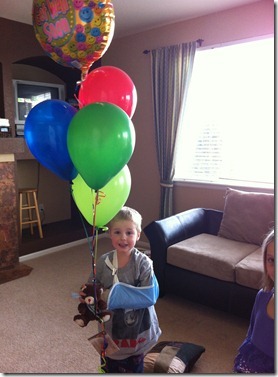 Grandma Banks and Grandpa Banks sent him some balloons and a teddy bear. It made his day to get a “special delivery” just for him. 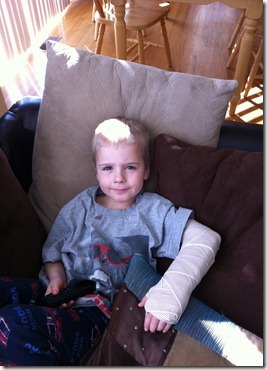 He has adjusted to his cast really well, and doesn’t complain about it much at all. 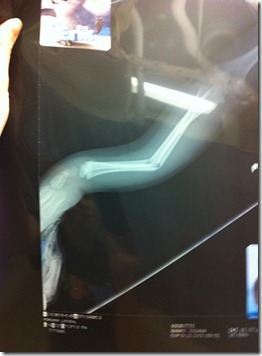 We are pretty impressed—Josh isn’t normally a very brave soul, but he has handled this like a champ! Oh my word Tara-that is crazy! 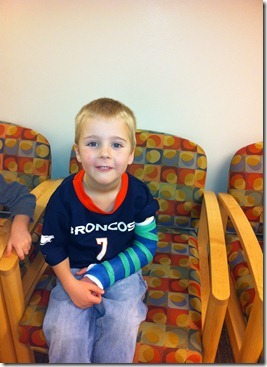 The weird thing is Cole's best friend just broke his elbow at the dinosaurs…probably a month ago. Those dinosaurs are a dangerous play area! Wow what a story! 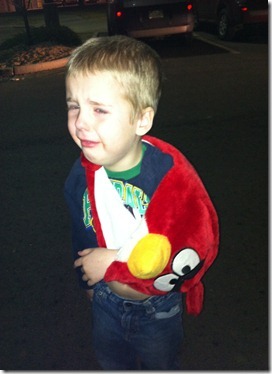 Love the angry birds sling! Hope he can heal quick. that is crazy. That picture of his arm makes me sick! I love his comment on Christmas about getting an ipad even though he's just a kid. He's funny. Remember last summer when he was in the back of your car and Sam was in the middle seat of your car and he told me “you better move your baby or I'm going to step on him.” Funny kid. Poor Josh! Poor Tara! You are a brave soul yourself 🙂 Glad he is coping well. Why didn't I know about this? I miss being in primary and seeing those kids every week! What a horrible break! That cast reminds me of Sophia's – over the elbow. How in the world did you handle ALL this with Rusty away? I have a special plastic bag to use when he bathes let me know if you are interested.